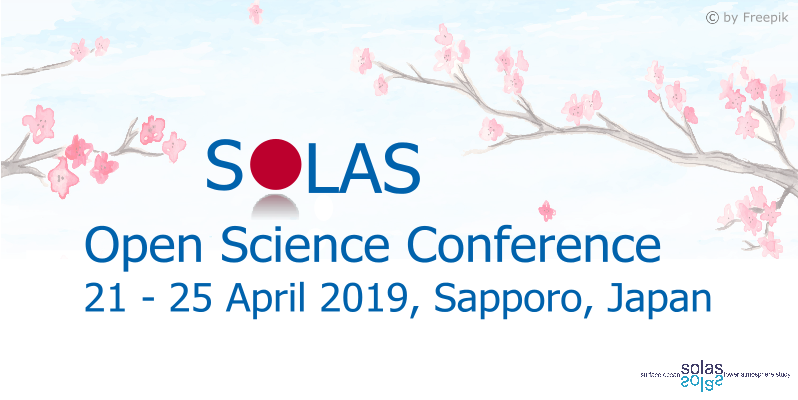 SOLAS Open Science Conference 2019: Registration, abstract submission, and discussion session submission is NOW OPEN!! See the conference website for plenary sessions and further details about the conference. A PDF including the 22 received national reports is available for download here. Individual reports and contact information of SOLAS national representatives are available here. More reports are expected and will be available online as they come in. Please contact the SOLAS IPO if your country has no SOLAS national representative yet, but you are interested in highlighting SOLAS research and share it with the SOLAS community. SOLAS welcomes Yuzo Miyazaki as the new national representative of Japan. Yuko is a associate professor from Hokkaido University. He investigates the origins and formation mechanisms of atmospheric organic aerosols from natural sources (both marine and terrestrial) and their biogeochemical interactions. At the same time, SOLAS sincerely thanks Mitsuo Uematsu for having initiated this network and run it. SOLAS also thanks Jun Nishioka for being the acting national representative of Japan in 2017. SOLAS co-sponsored the ECCWO which took place from June 4th to 8th 2018 in Washington DC, USA. Véronique Garçon, who participated in the ECCWO as SOLAS representative, served as symposium convener and gave an invited talk in session 7 "Eastern Boundary upwelling systems: diversity, coupled dynamics and sensitivity to climate change". An event report will follow on the session. PICES 2018 Annual Meeting session 10 on Ocean acidification and deoxygenation and their impact on ocean ecosystems: Synthesis and next steps, 25 October-4 November 2018, Yokohama, Japan. Submit an abstract by 15 June 2018 here. Call for external review of the second order drafts of chapters and the first draft of the Summary for Policymakers of the IPBES Global Assessment of Biodiversity and Ecosystem Services. Register and review by 29 June 2018. Details here. The 4th CLIOTOP Symposium on Oceanic Biodiversity under Climate Change, 15-19 October 2018, Keelung, Taiwan. Submit an abstract by 30 June 2018 here. São Paulo School of Advanced Methane Science, 16-26 October 2018, Ilhabela, Brazil. Apply by 30 June 2018 here. Scientific diving summer school, 19-27 September 2018, Aeolian Archipelago, Italy. Apply by 2 July 2018. More information here. Ocean Salinity Science Conference, 6-9 November 2018, Paris, France. Submit an abstract by 6 July 2018 here. The 3rd Integrated Carbon Observation System (ICOS) Science Conference, 11-13 September 2018, Prague, Czech Republic. Register by 12 July 2018 here. OCB Workshop on ‘Synthesis and intercomparison of ocean carbon uptake in CMIP6 models', 8-9 December 2018, Washington DC, USA. Apply by 13 July 2018 here. The IPCC invites nominations for Expert Reviewers for the First Order Draft of its "Special Report on Climate Change and Land (SRCCL)". Register by 29 July 2018. Details here. The international workshop on 'Cryospheric changes and their regional & global impacts', 31 July-1 August 2018, Dunhuang, China. More information here. The 11th edition of Sea Tech Week, 8-12 October 2018, Brest, France. More information here. 2018 Polar CORDEX Meeting, 17-19 October 2018, Warsaw, Poland. More information here. Workshop on 'Oceanic Methane and Nitrous Oxide: The Present Situation and Future Scenarios', 28-31 October 2018, UCLA Lake Arrowhead Conference Center, California, USA. More information here. GEOTRACES-PAGES synthesis workshop on 'Trace element and isotope proxies in paleoceanography', 3-5 December 2018, Aix-Marseille, France. More information here. 2017 WCRP CliC Annual Report available here. Call for Strategic Start-up Actions on Blue Growth in the Mediterranean.Submit a proposals by 15 July 2018 here. Belmont Forum Collaborative Research Action on Science-driven e-Infrastructure Innovation (SEI) for the Enhancement of Transnational, Interdisciplinary and Transdisciplinary Data Use in Environmental Change. Submit a proposal by 16 July 2018. Details here. Call for application for the Executive Director position of the European Marine Biological Resource Centre. Details here. Call for a new host for the CliC International Project Office. Submit an expression of interest by 1 September 2018. Details here.